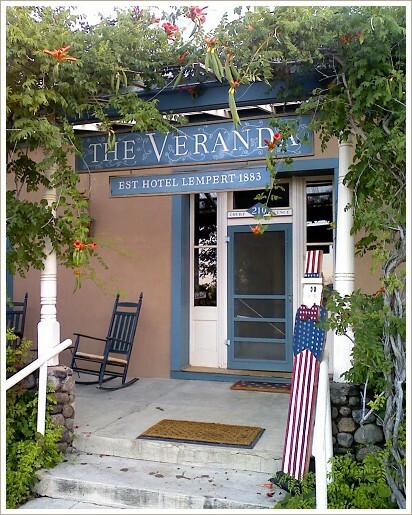 Located in mile-high Fort Davis, the Veranda Inn offers accommodations in a unique historic setting. Built in 1883, the Veranda is the oldest hotel in West Texas. This distinctive adobe building, with 2' thick walls and 12' high ceilings, has ten rooms and suites furnished in period antiques and collectibles. All rooms and suites have private baths. A separate Carriage House is under the shade of a large pecan tree. An excellent breakfast is served every morning, featuring "from scratch" recipes that our guests come back for. Occupying most of a town block, the inn's walled gardens and quiet courtyards shelter large verandas with rocking chairs and tables - the perfect spot for your morning coffee or evening glass of wine. The Veranda is ideal for small retreats, conferences and family reunions. Nearby are McDonald Observatory, Fort Davis National Historic Site, the Nature Conservancy's Davis Mountains Preserve, the Chihuahuan Desert Nature Center and Davis Mountains State Park. It is 2 and 1/2 hours to Big Bend National Park, 45 minutes to Balmorhea State Park, 20 minutes to Marfa (Chinati Art Foundation) and 25 minutes to Alpine (Museum of the Big Bend). We believe that your stay at the Veranda should be an experience unto itself. Our small size allows us to pay attention to every detail of your stay and provide you with a level of personal service you will not find in a larger establishment.